Thank you SO much for working with Malley.. the difference is amazing !!!! He is so much more polite now as opposed to pushing and bulling his way through. Jemine is a calm, assertive and easy to work with person who is so natural with dogs. The time and effort she puts into working with them is priceless. My dog Lux was with her on several occasions for quite some time. The last time that he was there was exclusively for training, for being very protective and aggressive with strangers. Every day that Lux was there, Jemine would email me with a full report of what happened in their day, where they went and what they did! Which was very comforting since we all missed him so much. Jemine is so alert and quick to see any signs in dog behaviour that my eye can’t even catch, and she easily corrects it too. Sometimes it made me wonder if I need training too! On top of that, when he came home I took him for a walk and he was so calm, alert and attentive only to me. He was heeling perfectly and focusing on me at all times. I couldn’t believe it. And that is not even the reason why I sent him for a training! 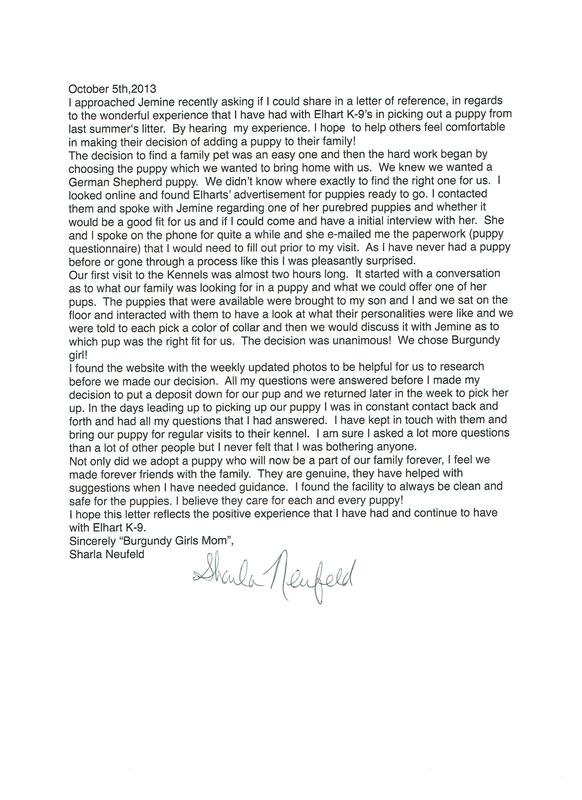 I would recommend this lady to all with any dog issues you may have. She is truly professional and friendly. Not only have I found a great dog trainer but I found a friend that I know will be there for me and my special dog Lux. The first pic proves to me that sometimes Brody is larger than a house. The second pic I think shows how the open sight on rifles was invented. (Aimed at two early bird geese on our pond). The 3rd and 4th pictures show what happens when you accidentally (insert wink) drop a kibble in the footprint of a deer in the deep snow. My boy can search with the best of them. I swear, I didn’t know when he’d come up for air. 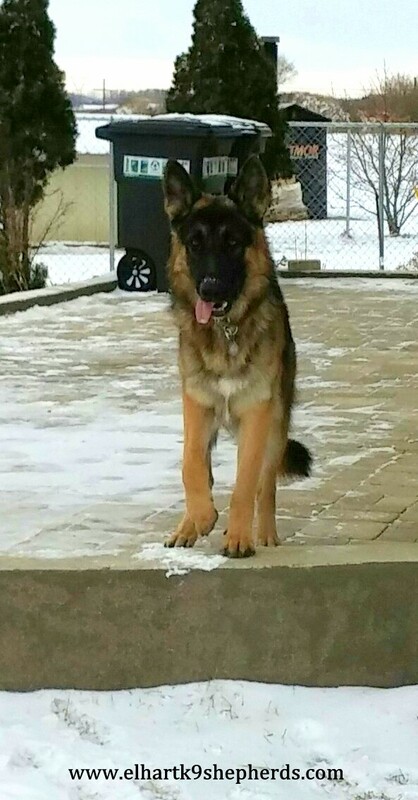 At 6 months of age, he weighs over 60 lbs, he can sit, down, shake a paw, wait for his command to eat (too funny, sometimes the poor boy just drools when waiting and likely saying “hurry up” to himself), he can play search inside and out (hide treats for him to find), goes to his mat when told, fetch, excellent on a leash and even has an invisible leash on occasion, runs to his crate when it’s bedtime and spends all night there with nary a whimper. 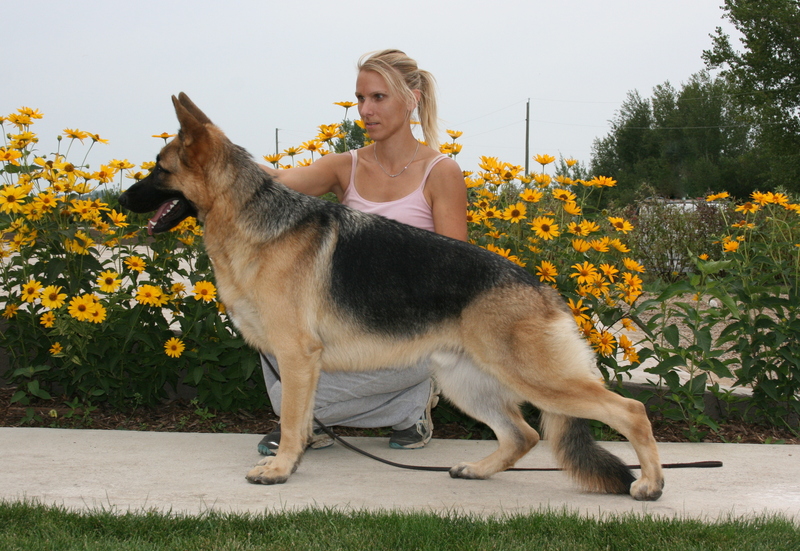 He is such an intelligent well trained dog and we have to give a lot of the credit to his breeding credentials and also his breeder Jemine Funk Hofer of Elhart K-9’s German Shepherd Dogs. Elhart’s is expecting another litter on May 1st so check out their website if anyone is interested. Don’t kid yourself, these dogs are a lot of work and need a lot of attention but by gosh, you’ll reap the rewards over and over again. We checked out several other breeders and hands down this was our favorite choice. I can’t believe where the time is going…..finally some nice weather! I wanted to send a few pics of Diesel, sorry it has taken me so long to get together! She really acts like part of the family, at soccer, baseball or any sport with a ball she is right in there playing with the girls and trying to take the ball! Just took Sarge in to the Vet Clinic, he did very well! They handed him a few treats and he didn’t even notice the shots. He has been doing great otherwise as well. The second day with us he did have diarrhea throughout the night but we managed to get out in time all but once. He listens well..does chase our cats but that is their fault as they take off when they see him. He loves our walks…miles and miles…And he already knows how to find home, starts running as we get near. He is eating well and is up to 13.6 kg…29.98 lbs!! He is a great dog and we thank you for letting him be a part of our family! We had an absolutely fabulous time yesterday. We had a lot of fun. Shelby is So proud of her new bone, she carries it with her wherever she goes. You are so kind and give such great encouragement and advice. You truly have a gift! Sarge has just landed in Island Lake this morning at 9:45. I will miss my one on one time with Sarge very much. Mornings were my favorite..and I am not a morning person! He would come out of kennel and want a total body rub down from head to tail, then he would flop down for his tummy rub..love his morning yawns..he is very vocal. Once that was done we would head outside. Business complete.. back in and he would play with a chew or a toy till I was out of shower. Then I would sit on floor by his food bowl and body rub down he wanted again..as well as a few pieces of food hand fed just to get him going. Once he decided one at a time wasn’t quite fast enough he would get up and eat some himself but he is a slow eater and lots of times takes breaks and then goes back to it; never rushes. Then while I was getting ready he would go into Evan’s room and wake Evan up..usually by grabbing something of Evan’s and chewing on it ..but it got Evan up! Then we would head outside for our morning walk..funny how he was hesitant when it started to get cold..I would tell him I didn’t want to be out in the cold either but we’re doing it..stop sniffing everything and get moving to stay warm! He is great in his kennel, goes in and out throughout the day..takes a toy and some kind of chew with him every night..never whines and sleeps right through the night. He was great with Evan..loved going outside to play frisbee and catch..not always return but working on it. Evan still held Sarge like a baby any chance he got and Sarge just loved it..totally relaxed. Evan would stay up later on weekends watching TV and so would Sarge..thank God both would sleep in and weren’t cranky the next day. The neighborhood kids will miss him as well..he loved the little girl across the street..never jumpy or biting. She came over all the time to go on the walks with Sarge. So yep, I will miss him…I may have more free time on my hands but I still tear up every time I think about him not being there today when I get home. Evan had a hard time and didn’t go back to sleep after saying a very tearful goodbye at 4am this morning, so I let him stay home till lunch.We will visit him whenever we can and hopefully he will get out often..but can’t wait till two years up and can have him around everyday again. Sarge is just a baby so it was hard to let him go…now I know how you felt! Thanks again for letting Sarge come home with us. beautiful she is, we all agree! Lily just got Coral to take a bath. 🙂 Not exactly happily, but for her kids, she put up with it. I’m starting to think they can talk that dog into anything. She’s doing very well with the cats, btw. She levelled out even more about a week ago, right around the time Bran (their other dog) fully accepted her and started greeting her with friendly gestures and play. Her repertoire now includes sit, stand, down, watch, crawl, spin left, spin right, jump up and touch nose to hand, a semi-compliant stay 🙂 and the beginnings of “find it” for nose work. Just thought we’d send you a few pictures of Archie. It’s like he has lived with us all his life. Hasn’t skipped a beat and him and the cat are civil now lol! Thanks again so much for the opportunity to have him, he is amazing!